Catriona Summers' debut in show business came early. Her father, the leader of a travelling music hall troupe that toured the small towns of the Outback, carried her on stage when she was barely minutes old in order to introduce her to her first audience. From such humble beginnings Catriona had grown up to emerge as a rare talent, her voice garnering her praise from the public and critics alike. But her journey from performing popular songs for a few pennies to becoming an acclaimed opera diva on the Sydney stage, has been fraught with hardship and tragedy. I was supposed to read Dreamscapes as a holiday read last year but I decided on another book instead and right before my reading marathon ended, I thought why not give it a go. It was an okay book. It wasn't that great but it wasn't really that bad either. I just felt like the story wasn't properly developed and the whole story line felt a bit rush as in for a moment Catriona was just born but the next moment she's nine years old and the next she's twelve, thirteen and so on and before you know it, the story moved years into future and suddenly she's in her fifties and sixties! I just don't really understand why the author need the timeline to be moved so fast and perhaps the same outcome can be achieved by a less paced timeline. I would prefer for the story to end when she's much younger and to have an epilogue for when she's really old. Other than that, the story is set in the Australia outback and it's quite a change and ironically pretty refreshing to read about the harshness of the environment and brings the story to a different dimension. 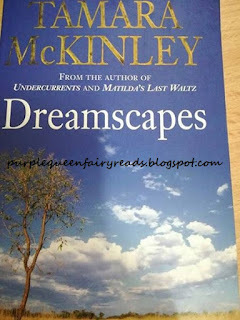 While I have no issue with Dreamscapes, I will not be on a look out for other titles by this author in the near future.